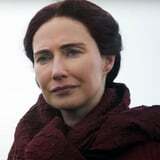 The other day, while reminiscing about the last season of Game of Thrones, I found myself wondering what the hell ever happened to Melisandre. Although the eighth and final season of the HBO series will likely revolve around the comes and goings of the most powerful characters in Westeros - Daenerys Targaryen, Jon Snow, Cersei Lannister, and the dreaded Night King - the Red Woman remains an important reminder of how forces behind the scenes could potentially shape the end of the story. Early on in season seven Melisandre rides off into the sunset after making "terrible mistakes" that permanently put her on Jon Snow's sh*t list. She explains as much to Varys during a cryptic conversation they share on the windy cliffs of Dragonstone in season seven's third episode, "The Queen's Justice." According to the Red Priestess, she plans on leaving Westeros now that she's united ice and fire - aka Jon and Daenerys - and plans to return to Volantis, which is a city in the nation of Essos (aka where she was born). So, what business has Melisandre been conducting in Volantis since her sudden departure? No one can say for certain, since the Red Priestess neglects to tell Varys what she plans on doing during her vacation from Westeros. However, it's a safe bet that she's pulling strings behind the scenes that will help (or at least potentially help) Jon and Dany conquer the Night King and the rest of the White Walkers, in addition to Cersei.